BourbonBlog.com joins Frontier Liquors at Biaggi’s Wine Room in Evansville, Indiana to select a special barrel which is now bottled and available for purchase! Four Roses Distillery allows retailers like Frontier Liquors to select a private barrel to offer their customers (explained below). This one of a kind is barrel we selected with Frontier Liquors can be purchased all Evansville Frontier locations for $39.99 for a 750 ml bottle (while supplies last). One you taste this hand-selected OBSV recipe, you’ll understand just how unique a Four Roses Bourbon can taste when privately selected. 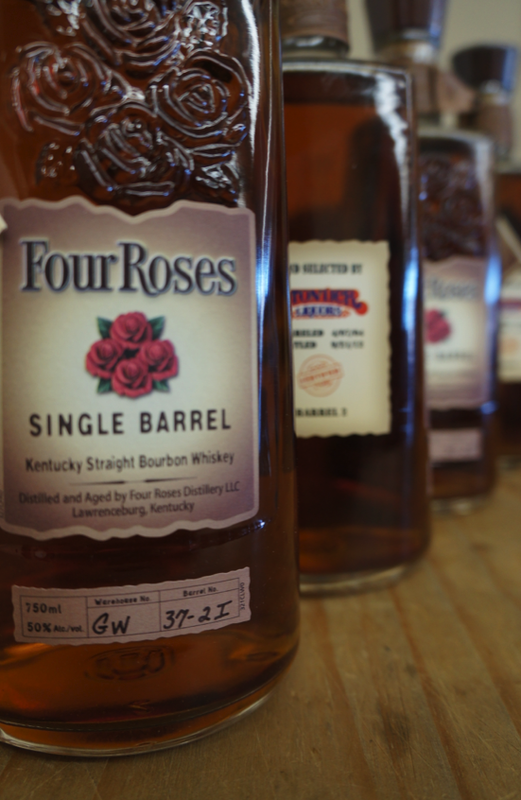 You still taste the signature Four Roses DNA and delicious flavors along with additional nuances, surprises and notes! Our review is coming. In the video segment above, watch us walk through the process of selecting John Mccullough, Owner Frontier Liquors as Dan Gardner of Four Roses Bourbon brings us the samples to taste. Every sample from the 5 unique barrels we chose from were amazing. As the selections ranged from 114 to 122 proof at barrel strength, the evening was true pleasure. We are confident that we selected the very best for you to own and enjoy with friends! This Four Roses Single Barrel Private Selection 2012 bearing the Frontier Liquors logo and barreled/bottled on date makes a great holiday or Christmas present for the whiskey lover in your life! The only place in the world you can find our bottle is at Frontier Liquors in Evansville! Retailers can choose their own barrel of Four Roses award-winning premium Single Barrel Bourbon. Master Distiller Jim Rutledge hand-selects a number of exceptional barrels of the Single Barrel recipe, each aged between 7 and 8 years. The retailer tastes up to five of these barrels, then selects the one to offer to their most discerning, Bourbon-loving customers. 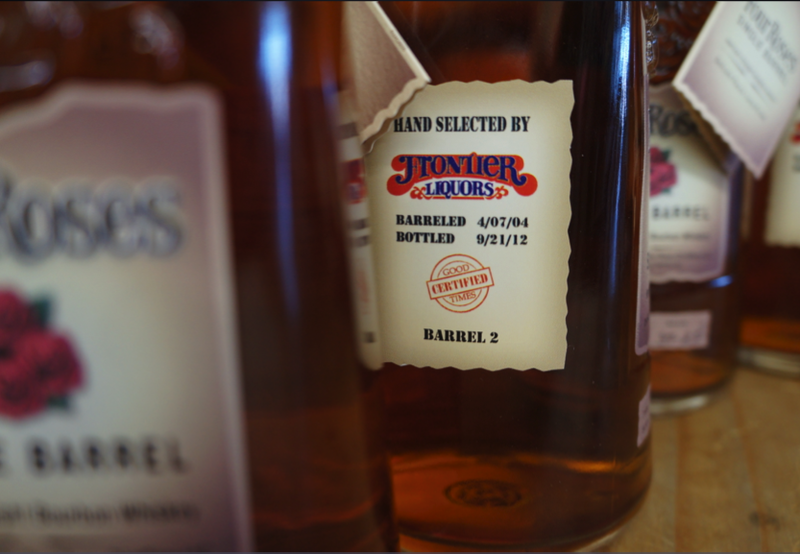 The barrel is bottled at 100 proof and is marked with a special label signifying the retailer’s special selection. Edited, filmed and produced by Lewis Chaney and Neil Kellen of Keychain Productions. This is a great insight into the barrel selection Tom! I love when retailers go in and select their own bottle. That’s one of my favorite things to see when I walk into a retail shop is the different single barrels they’ve chosen. At my local shop they have a Buffalo Trace & Blantons right now. Very cool!